"Maribojoc, Bohol is badly in need of attention and help now. Most especially in Brgy. Bayacabac a secluded/isolated area. All was trap in between. There are rumors that there are a lot of dead folks on the barangay. Caused by landslides. Loon, Cortes and Maribojoc is inneed now!!! They need a rescue team immediately! Please send this to the authority for immediate action. Asa man ang kabilya sa karsada? Wa may kabilyang nakita? potable water is being brought to san isidro town from cebu. lord have mercy. 75% of power supply in the Province of Bohol has been restored. A total of 2,066 houses were damaged (605 totally / 1,461 partially) in Bohol and Cebu. 20 bridges and 4 roads are still not passable in Bohol. A total of P75,150,000 worth of damaged roads, bridges and flood control were reported in the Provinces of Cebu (P17,650,000) and Bohol (P57,500,000). Walang natira sa kilalang Loon Church ng Loon, Bohol. I just arrived in New Jersey and had a long talk with my parents. I was updated on Valencia's situation. The Santo Nino Parish Church was not damaged. Thanks be to God. Glory be to the Holy Infant Jesus, Senyor Santo Nino ! The day of the earthquake, my uncle alex, uncle romeo and my tita lerma and tita linda was with my grandfather in valencia. in the morning the quake occurred. Salamat sa Grasaya sa Ginoo, nothing was damaged, and no one was hurt. Thank You, Lord!! Viva Senyor Santo Nino! Viva ! Viva ! Viva ! Lord, have mercy on us. Christ, have mercy on us. Lord, have mercy on us. Jesus, hear us. Jesus, graciously hear us. In every need let us come to you with humble trust, Santo Nino, help us. In all our doubts, perplexities, and Temptations Santo Nino, help us. In hours of loneliness, weariness and trials, Santo Nino, help us. In the failure of our plans and hopes Santo Nino, help us. In disappointments, troubles and sorrows, Santo Nino, help us. When others fail us, and your Grace alone can assist us, Santo Nino, help us. When we throw ourselves on Your Tender Love as our only Refuge, Santo Nino, help us. When our heart is cast down by failure, Santo Nino, help us. When we are ill, and our head and hands cannot work and we are lonely, Santo Nino, help us. 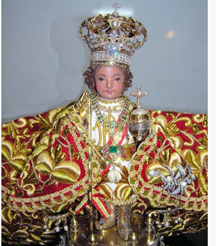 When we feel impatient, and our cross irritates us, Santo Nino, help us. Always, always, in spite of weakness, falls and shortcomings of every kind. Santo Nino. Help us. Lamb of God, who take away the sins of the world; Spare us, O Jesus. Lamb of God, who take away the sins of the world; Graciously hear us, O Jesus. Lamb of God, who take away the sins of the world; Have mercy upon us, O Jesus. Jesus, hear us. Jesus, Graciously hear us. Oh, sweet and merciful Jesus! Senor Santo Nino, the source of all goodness, We kneel before Your sacred image, imploring Your Divine aid for universal peace and brotherhood among all men, enlighten the unbelievers and the heathens so that they will believe You as their true God. Restore the faith of those who have wandered away from You, bring them back to Your fold with repentance in their hearts. Grant also to faithful departed in Purgatory the remission of all their sins so that they will rest in peace forever. Finally, nourish and strengthen our faith in You so that we will serve You faithfully on earth. AMEN. *You are the Patron of Cebu and the Philippines, *We come to you; *You have made *extraordinary wonders through Your Miraculous Image *in these chosen Islands, *remember us. Look down at this poor soul *that comes to You for help. Lead us with Your wisdom. *discipline us with Your Truth, *console us with Your Tenderness, *protect us with Your Might. We consecrate today *our thoughts to You, *only with You *shall they be occupied; *our words, *only of You *shall they speak; *our sufferings, that we may endure them *for Your sake. We beg You, *Senor Santo Nino, *illumine our understanding, *kindle our will, *cleanse our body, *sanctify our soul. *We wish what You wish, *because You wish, *as You wish, *as long as You wish. Grant us, Senor Santo Nino, *that We may feel *love toward You, *be strict toward ourselves *be zealous toward our fellowmen, *and rightly despise *the things of the world. *Help us *to overcome sensuality *with strict discipline, *avariciousness with generosity, *anger with gentleness, *indolence with zealous industry. *Make us wise in counsel, *courageous in danger, *patient in adversity, *humble in prosperity. Teach us, *dear Santo Nino, *how worthless is the world, *how sublime is heaven, *how brief is time, *how long is eternity. *Grant us, lastly, that We may remember You, *adore You, *love You, *and serve You *here on earth *that We may be happy with You *forever and ever in Heaven. Amen.